You can find more than 500 accredited free online college classes that provide you with the opportunity to make use of research-based academic resources from some of the world’s best universities. You can use these resources to advance your understanding of a wide range of academic topics. 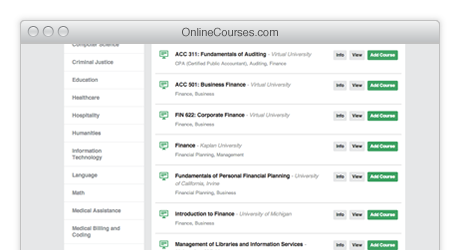 The free courses listed are considered Massive Open Online Courses (MOOCs). By definition, MOOC means that any interested learner is able to participate in the course. There are no prerequisites or other qualifiers separating an interested student and the material, although some advanced courses will expect that learners have completed other coursework or have a certain level of knowledge in a related area. To choose the Best Online Courses for 2016, we first started with our list of the Best Online Course Providers for 2016. Those providers were chosen based on the number and variety of courses offered, the number of students enrolled in them, and their quality based on curriculum, professors, and reviews. From there, we selected the top course from each provider based on student enrollment and positive reviews to compile this list. Learn from top colleges anytime, anywhere with Online Courses. Using the selector tools , explore top online classes in nearly any field, including microbiology, mathematics, language and psychology. You can also get a head start in your career with courses in business and accounting from some of the best schools in the country. Build a curriculum that fits your needs. Pick and choose courses from different schools in a variety of knowledge areas. With this comprehensive directory of free online open courseware, you have unlimited freedom to create a customized study plan that helps you fill in the gaps in your knowledge or simply explore a subject that interests you. Keep track of what you’ve learned and what you still want to discover using the featured tools. When you create a profile, you can log in to the site to check your progress and plan for the future at any time. With all this information at your fingertips, you can determine at a glance the areas you haven’t studied and tailor your education to be as specific or as expansive as you’d like. Additional schools, online classes, and open courseware are added to the directory frequently. Our mission is to provide the most comprehensive and high-quality listing of courses on the web, so make it a point to check back often for updates to our course selection, some of which even provide affordable options for college credit. 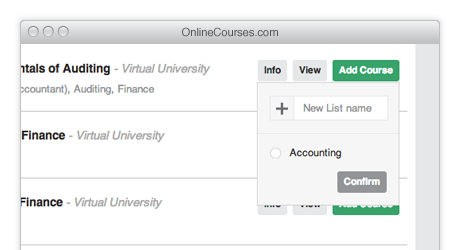 Additional schools, online classes, and open courseware are added to our directory frequently. Our mission is to provide the most comprehensive and high-quality listing of courses on the web, so make it a point to check back often for updates to our course selection, some of which even provide affordable options for college credit. U-Mass. Harvard. Yale. These iconic institutions are just a fraction of the reputable schools that provide free online courseware for you through this site, along with notable universities like University of California, MIT, and the University of Michigan. Set yourself up for future success by using open courseware based on the best online course products of these top schools. There are no hard-and-fast rules to free online courses (MOOCs), but there are some commonalities that can be found in most of them. One thing learners can usually find when investigating available courses is the syllabus for the course, which will outline what is covered. Most MOOCs consist of a series of video lectures that are intended to instruct the learner on the material. Often, the course will include quizzes after some or all of the lectures. These are intended to make sure the learner is grasping the material. Depending on the MOOC structure, getting a passing grade on a quiz may be required to begin the next set of lectures. In addition to quizzes, some MOOCs may include homework assignments. These assignments may be reading supplemental materials (which may be available for free online or may require purchasing a digital or physical textbook). Some homework assignments may be completing problems, doing a lab or other “typical” homework. Finally, some MOOCs may have a final examination or assignment. If receiving a certification or college credit is an option, completing this final examination or assignment will almost certainly be a requirement for passing the course. Over the past several years, the online educational landscape has exploded as more providers than ever sought to offer their content online. With the popularity of Massive Open Online Courses (MOOCs), quality education has never been more available to people around the world. Courses on any topic, taught by professors from prestigious universities around the world, are now available to anyone at any time. However, this increase in content and providers created a new issue that was unimaginable decades before: the presence of too much content. With all that is available, how can students navigate the educational landscape? How can they decide which providers offer the best experience? To address this issue, OnlineCourses.com has a created a list of the best providers of online education in 2016 to help students navigate this new environment and obtain their educational goals. The following list is in no specific order, all have met our quality standards and recommend them fully to all students. With a current offering of 16 educational tracks in web development and programming languages, Code Academy seeks to revolutionize the world of education. Looking to the changes that the web has brought to commerce, healthcare, and others, Code Academy looks to transition from the traditional classroom and deliver an engaging educational experience entirely online. Designed with beginnings in mind, each track offers a carefully curated set of courses designed to ensure content mastery by the end the track. For those looking for a more personal experience, Code Academy offers Pro Content which features individual learning plans, access to instructors, and additional resources to ensure that you meet your individual goals. Offering over 1,500 courses from 140 partner institutions in 20 countries, Coursera is a leader in providing universal access to a world class online educational experience. Their approach, based on the concept of mastery learning, ensures that students are comfortable with the material before moving to the next section and when combined with a peer assessment component allows students to receive immediate feedback to improve their experience. For those wanting a deeper delve into a specific topic or recognition of your skill mastery from an employer, Cousera offers Specialization certificates. Each Specialization provides a guided experience in a variety of subjects and ends with a Capstone Project to demonstrate your mastery of the topic to a current or future employer. Distinguishing itself from other online educational providers, DataCamp offers a current collection of 13 courses designed exclusively around data science. Using partnerships with academia and companies in the business world, DataCamp offers in demand data analysis skills in the R and Python programming languages. Each introductory programming course is offered free of charge so students can gage their interest before delving into more advanced topics for a monthly fee. Courses are taught in an interactive programming environment which does not require downloading the programming languages so all you need is an internet connection to get started. Offering 820 courses in 30 subjects from 85 institutional partners, Edx provides free high quality education to anyone, anywhere. With its foundations in academia, each course brings together experts in government, academia, and industry to provide an in depth education experience on your schedule. For those looking for a more structured experience, Edx offers XSeries Programs which allow students to delve deeply and develop masterly over a particular topic of interest. At the same time you are learning, EdX is partnering with top institutions who are conducting research and using their findings to further improve the learning experience. With over 140 courses in 13 categories from 76 partner institutions, FutureLearn fosters a unique social and interactive learning environment. The FutureLearn approach is built on the notion that sharing and debating ideas is how people learn best. Courses use storytelling principles to take learners through a narrative journey involving interactions with other learners, opportunities to reflect on what is learned, and celebration of the accomplishments of each learner. FutureLearn organizes its courses into a series of collections for learners looking to focus on a specific subject but also offers individual courses for casual learners. Starting from the humble origins of one man tutoring his nephew, Khan Academy has grown into a leading provider of world class education. Keeping with its original intent, Khan Academy provides over 36 million learners with a personalized learning experience for students of all ages. Each student has access to courses anytime, anywhere and can view their progress through the personalized learning dashboard. Each course is designed not only to develop masterly of a subject but to encourage a mindset of lifelong learning. Khan Academy also offers a unique coaching platform so instructors or parents can view the individual strengths and weaknesses of students after each course. Offering over 4,000 courses in 12 subject areas, Lynda helps learners achieve their full potential on their schedule. With courses ranging from business, technology, and creative skills taught by industry experts, Lynda provides quality instruction to individuals, businesses, and governments. Courses are taught at a variety of levels to ensure individuals starting out will find the material just as valuable as experienced professionals. Seeking to match the mobility of learners in the modern world, Lynda courses are available on a variety of platforms to ensure that learners have access at home or on the go. Breaking from its origins in the classroom, The Great Courses removes the trappings of the university lecture hall while providing you with an engaging and informative educational experience. Offering over 500 courses in 12 subject categories, The Great Courses provides lectures from world class professors in video and audio format to suit your schedule. Taking a unique approach to course development, The Great Courses enlists the assistance of learners in choosing each course and professor. This ensures the course offering are responsive to learner’s interests and remain at the highest quality. Offering over 100 courses with 13 specializations in 7 in demand areas, Udacity provides an affordable, engaging and accessible higher educational experience to learners around the world. Driven by the belief that higher education is a basic human right and partnering with industry leaders in the technology sector, Udacity brings an affordable educational experience that is endorsed by employers. What truly sets Udacity apart from competitors are the Nanodegrees designed to get students hired as Data Analysts, Mobile Developers, Web Developers etc. with leading technology companies. They are so confident that their degrees will get students hired that they offer partial or full tuition reimbursements if you are not hired with 6 months of completing the degree. Focusing strictly on you and what you want to learn, Udemy offers over 35,000 courses from 19,000 instructors in over 190 countries on a wide variety of topics. 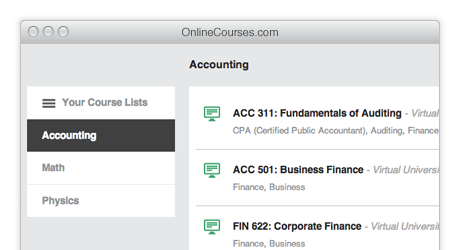 With a goal of allowing students anywhere to learn anything on their own schedule, Udemy is designed to be easy to use and accessible on any device. However, what makes Udemy stand out from other providers is their commitment to creating new content and allowing experts in any topic to reach students. Experts with backgrounds as Yoga and Computer Science can teach classes and use their experience to impact the daily lives of students.